What could cause a purchase to be declined? How can a player ensure a successful purchase? Xsolla has 24/7 live chat support to assist purchasing problems through their platform. Click the "Contact us" button in the bottom corner of the payment page. 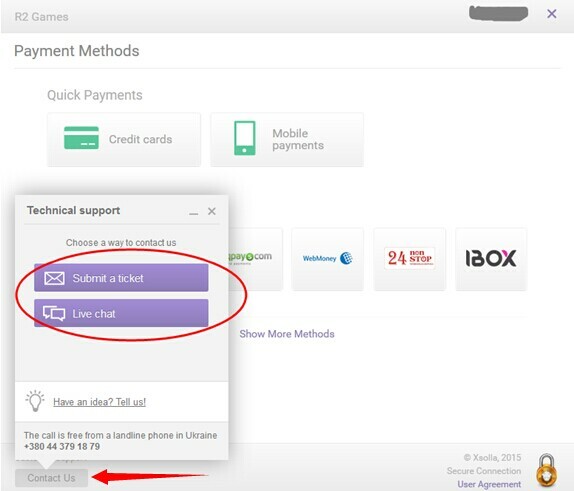 This will give players the ability to open a live chat or send an email to get issues resolved. Most of the time, Xsolla is able to assist players through most purchasing problems. They may direct players back to R2Games if payment shows successful on their end, but still wasn't received.